"We found it imperative to create awareness that education has the capacity to change the fate of a nation through social and economic empowerment." Student groups at the University of Witswatersrand hosted two screenings of Girl Rising. All of the proceeds from these screenings went to the university's bursaries fund for students scholarships. 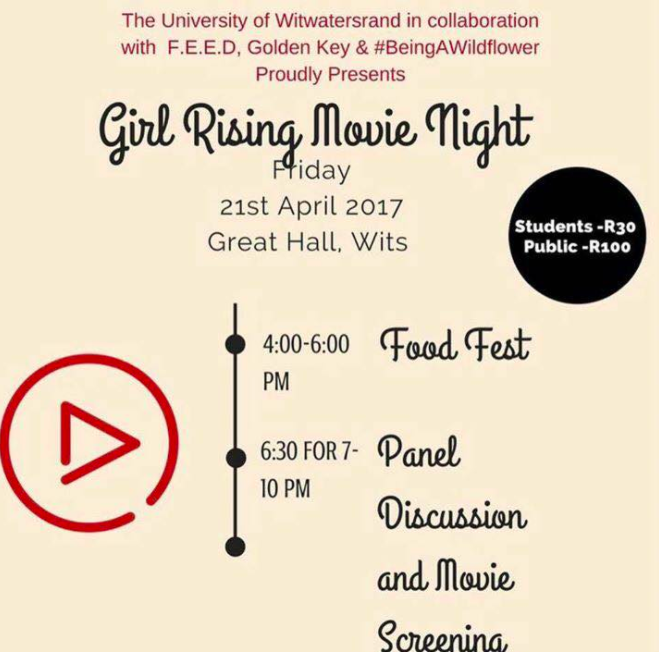 The student groups The University of Wits, F.E.E.D., Golden Key Association and #BeingAWildFlower, along with the on campus women's empowerment student association, hosted two screenings of Girl Rising on April 21, 2017. All proceeds from the screening went to support the university's bursaries fund for students scholarships. The event included a Food Fest and Panel discussion. "In South Africa, with the scourge of HIV and a big part of the population being run by child-headed homes, we found it imperative to create awareness that education has the capacity to change the fate of a nation through social and economic empowerment," the event's organizers said. Following a successful screening, they are continuing to take their message and mission forward, adding that, "We are looking to introduce this movie through as many platforms as possible to get individuals, schools, NGOs and corporates to endear themselves to the initiative so that we may extend viewership and mentorship to impoverished schools and rural girls to change the dynamic in our South African demographic."